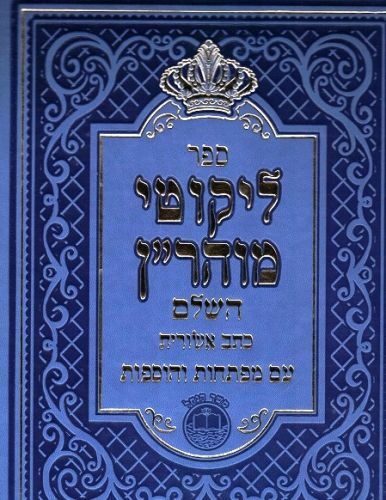 Author: Rebbe Nachman of Breslov / Reb Noson / Reb Shimon Weisenfeld Description: The only Toras Noson , which is a major peirush on Likute Moharan, that is currently available. 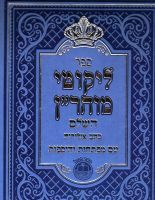 This sefer contains:1) Likutei Moharan - The collected discourses of Rebbe Nachman, edited by his leading disciple, Reb Noson. Part I consists of the lessons first published during the Rebbe's lifetime (although in somewhat different form), and Part II consists of the lessons first published separately during the year after the Rebbe's passing. Likutei Moharan is the core text of Breslover Chassidus, and serves as the basis of Reb Noson's eight-volume masterwork, Likkuei Halakhos . Beautifully printed in Ksav Ashuris, the letters with which Sifrei Torah etc. are written. Includes indexes and additional material. Also including several additions: 2) Toras Noson, a commentary gleaned from Reb Noson's Likkutei Halakhos, Rashi lettering without nekudos, compiled by the late Rabbi Noson Zvi Kenig of Bnei Brak; 3) Sefas HaNachal, an index of citations from the Gemara, Midrash, Zohar, etc., in the Rebbe's works, compiled by Rabbi Shimon Weisenfeld; plus an appendix of variant texts from manuscripts on numerous lessons; comprehensive subject index, etc. Publishing Data: Meshekh HaNachal, Jerusalem. 9" x 12", 1088 pp. HB, with nekudos. Comes in various colors.